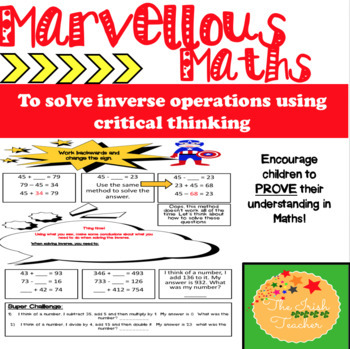 A ONE page worksheet on inverse operations for KS2! I use this one sheet for each ability group within my Year 4 class. I differentiate through support rather than work. Yes the lower ability children may need more initial support and resources, but they are flying in confidence and in Maths ability. This sheet allows children to move on to a harder challenge every 3 questions, thus challenging each ability group at all times. Before children start their activity, they need to critically think about a statement written on the paper (work backwards and change the sign). I allow them to talk in mixed ability pairs about this statement and PROVE that it is correct/incorrect before they start their activity. By doing this, children learn to justify their own answers in Mathematics, thus having an overall better understanding for the Mathematical concepts. I have adopted this strategy for all topics and it’s proving very effective in children’s understanding. 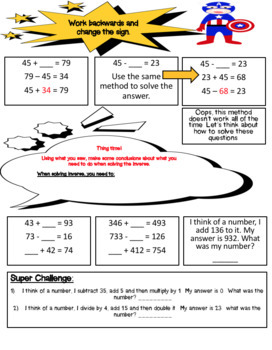 GIve it a try and be sure to let me know how it worked in your classroom.